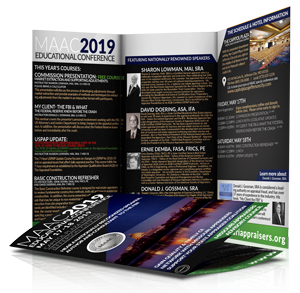 The 2019 MAAC Educational Conference is coming soon! before class. Please arrive early to sign in. This presentation will discuss the process of developing adjustments through market extraction and provide examples of methods and techniques for extracting adjustments from the market in an interactive format with participants.Gain 3.5 hours CE for free! Partcipants must register to attend this popular seminar. Look for your brochure in the mail. Brochures are being mailed April 4th, 2019. Look for yours in the mail! Download previous conference brochures here. Donald J. Gossman, SRA, is the chief appraiser at Gossman Consulting, LLC. During his career he has served as President of the Kansas City Chapter of the Appraisal Institute, a member of the Missouri Appraiser Advisory Council, member of the Missouri Housing Alliance, on the board of directors for the Kansas City MBA and the Education Chairman of the Kansas City Appraisal Institute. He holds the prestigious SRA designation from the Appraisal Institute and is a certified appraiser in 7 states. He has more than 40 years of experience and operated his own firm for 28 years. In 2006, he helped the FBI bust an appraisal fraud ring, and later wrote about his experience in “My Client the FBI”. Gossman was a keynote speaker at the Appraisal Institute’s 2018 Annual Conference in Nashville, Tennessee. David Doering, ASA, IFA is a State Certified Residential Real Estate Appraiser with over 30 years of experience in the appraisal profession. He holds the ASA – Senior Accredited Appraiser and the IFA - Residential Appraisal Specialist designations of the American Society of Appraiser (ASA) and is an AQB Certified USPAP Instructor. He has been a guest lecturer on real estate appraisal principles for business and real estate courses at Lincoln University as well has been fundamental in the development and presentation of numerous real estate appraisal continuing education courses and seminars. He is a Past National President of the National Association of Independent Fee Appraisers, Past Chair of the Missouri Realtors® - Appraisal Section, a member of the ASA – NAIFA Real Property Committee and currently the President of the Missouri Appraisers Advisory Coalition. Ernie Demba, FASA, FRICS, PE is State Certified General Real Estate Appraiser and holds the FASA – Fellow of the American Society of Appraiser, FRICS – Fellow of the Royal Institute of Chartered Surveyors and the IFAS – Senior Appraisal Specialist designations of the American Society of Appraiser (ASA) and is an AQB Certified USPAP Instructor. He has an MBA, an MS in Engineering, is a Professional Engineer. In addition, Mr. Demba is a designated review appraiser and is practicing general certified real estate appraiser. He currently teaches in the Economics Department of Washington University. Mr. Demba is a Member of the ASA – NAIFA Real Property Committee and Appraisal Management and Review Committee and Vice President of Missouri Appraisers Advisory Coalition as well as a Senior Nationa Instructor of the American Society of Appraisers. Sharon K. Lowman, MAI, SRA is a Certified General appraiser who is a nationally recognized appraiser and instructor. Now celebrating her 50th year in the appraisal profession, Ms. Lowman has appraised most all type properties and has over 40 years of national teaching experience. Ms. Lowman owns Lowman & Co., a national real estate appraisal school. She also was the Real Estate Appraisal Specialist for the Central Region of the USA (26 state area) for the Resolution Trust Corporation. She has developed and taught numerous courses/seminars for appraisers, including the Residential and General Certification Exam Preparatory Session for Missouri Appraisers. Ms. Sharon Lowman is a past chairperson of the Missouri Real Estate Appraisers Commission. She is accredited by the Appraisal Foundation as an AQB Certified USPAP Instructor. This presentation will discuss the process of developing adjustments through market extraction and provide examples of methods and techniques for extracting adjustments from the market in an interactive format with participants. Gain 3.5 hours CE for free! Participants must register to attend this popular seminar. This seminar covers the presenter’s personal involvement working with the FBI, US Attorney’s and Justice Department to bring changes to the appraisal profession. In addition, the presentation will discuss what the Federal Reserve knew before and immediately after the crash. Participants must have a readable copy of the 2018-19 uspap to receive course credit. The 7-Hour USPAP Update Course focuses on change to USPAP for 2018-19 and on appraisal issues that affect daily appraisal practice. This course fulfills the 7-hour requirement as established by the Appraiser Qualification Board (AQB) of The Appraisal Foundation. This course provides a practical guide for appraisers on how to avoid liability and common errors that require revisions within the context of USPAP, FIRREA and the Wall Street Reform and Consumer Protection Act. The course will explore those questions as well as delve into the role of the reviewer, the obligations of the appraiser, relevant USPAP regulations, common errors that appraisers can avoid, and the importance of structured report writing. 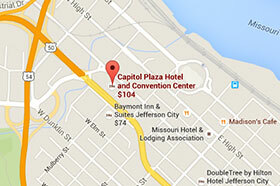 With its convenient downtown setting, the Capitol Plaza Hotel Jefferson City puts you right in the middle of all there is to see and do in Missouri’s vibrant capital city. MAAC has arranged for discounted rooms for the conference. 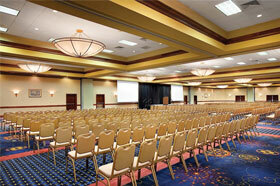 Register for the entire conference (14hrs CE) for only $340. This includes Friday and Saturday Lunch. 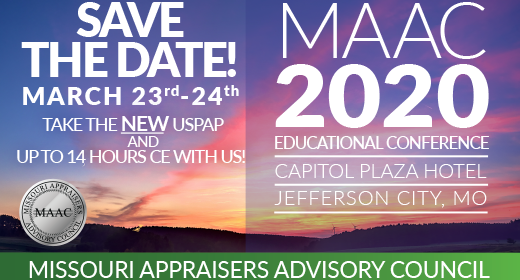 An annual update from the Missouri Appraisers Commission. This presentation will discuss the process of developing adjustments through market extraction and provide examples of methods and techniques for extracting adjustments from the market in an interactive format with participants. Gain 3.5 hours CE for free! Participants must register to attend this popular seminar. No lunches included. This seminar covers the presenter’s personal involvement working with the FBI, US Attorney’s and Justice Department to bring changes to the appraisal profession. In addition, the presentation will discuss what the Federal Reserve knew before and immediately after the crash. No lunches included. The 7-Hour USPAP Update Course focuses on change to USPAP for 2018-19 and on appraisal issues that affect daily appraisal practice. This course fulfills the 7-hour requirement as established by the Appraiser Qualification Board (AQB) of The Appraisal Foundation. No lunches included. This course provides a practical guide for appraisers on how to avoid liability and common errors that require revisions within the context of USPAP, FIRREA and the Wall Street Reform and Consumer Protection Act. The course will explore those questions as well as delve into the role of the reviewer, the obligations of the appraiser, relevant USPAP regulations, common errors that appraisers can avoid, and the importance of structured report writing. No lunches included. Purchase this if you would like to be served lunch on Friday, May 17th. Conference packages come with lunch already. Individually purchased courses do not. Purchase this if you would like to be served lunch on Saturday, May 18th. Conference packages come with lunch already. Individually purchased courses do not.